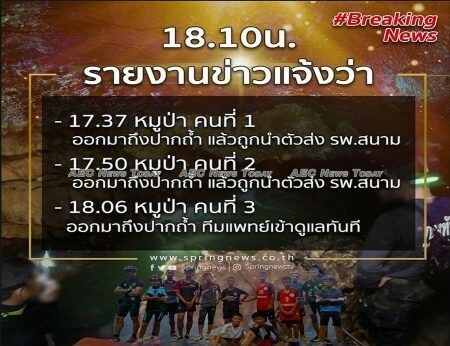 Shortly before 6.30pm local time (GMT +7) on July 8, 2018 local Thai media Fresh News reported that three of the Thai teen soccer players had been evacuated from the cave and were being assessed at medical facilities at the cave entrance. 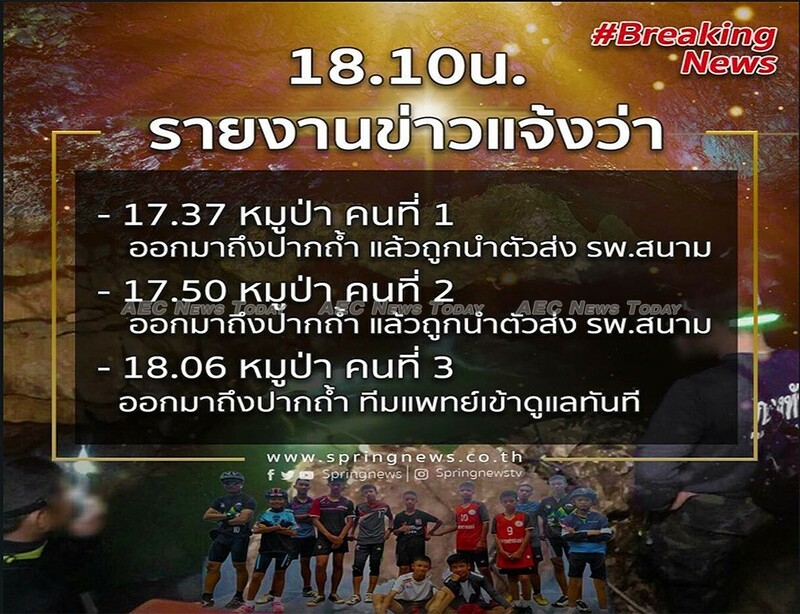 According to the now confirmed reports the first boy emerged from the cave complex at 5.37pm, followed by a second and third at 5.50pm, and 6.06pm respectively. A little after 7.30pm Bangkok Post tweeted that three additional members of the team were in chamber three of the cave. Shortly before 7.50pm Bangkok Post further reported that the first ambulances had arrived at Chiangrai Prachanukroh Hospital, while just after 8pm it reported that a fourth member of the Moo Pa (Wild Boar) Academy Mae Sai football team had exited the cave. Some time later it was announced that the rescue operation would be suspended overnight. The rescue commenced at about 10am local time today when five Thai Navy Seals and 13 foreign cave diving experts entered Tham Luang Cave in northern Thailand to begin the rescue phase of the 16-day long operation to save the 13 members of the Moo Pa (Wild Boar) Academy Mae Sai football team. Faced with forecasts of heavy rain in the days ahead, as well as dwindling useable oxygen levels in the cave, Narongsak Osottanakorn, Commander of the Joint Administration Center for Rescue Operations (Jacro) at Tham Luang Cave said on Saturday morning “now is the best time to go”. Describing the stage ahead as “one of the world’s most challenging rescue missions where diving skills are very much required”, Mr Osottanakorn thanked friendly nations, companies and individuals who have rushed expertise, equipment, and personnel from across the globe to assist the mission to save the trapped teen football team and their 25-year-old coach. International participation in the search and rescue operation includes diving and rescue specialists from the UK, US, China, Myanmar, Lao PDR, and Australia. Yesterday US entrepreneur Ellon Musk announced he had despatched SpaceX and Boring Company engineers to also assist. Domestically tens of thousands of Thais have contributed with food, donations, or labour, while millions have prayed to their god’s for the team’s safe return to the surface. For more than the past week Thailand Navy Seals have been placing air tanks spaced approximately 25 meters (about 82 ft) apart inside the Tham Luang Cave tunnel network. The operation cost the life of former Thai Navy Seal Petty Officer First Class Saman Kunan who drowned inside the cave network on his way back to the entrance after delivering air tanks. According to a statement issued by Thailand’s Ministry of Foreign Affairs (MFA) the search for alternate entrances into the cave is ongoing with 18 holes having been surveyed, with four of them having been drilled. The effectiveness of drilling is questionable however, as the exact location of where the drill might enter the cave is not known. Explaining that the ‘Pattaya Beach’ area where the Thai football team, their coach, and members of the Thai Navy Seal’s are currently located is sealed by the water, Mr Osottanakorn said carbon dioxide levels were increasing, while additional rain might make it impossible to maintain supplying the team with water, food, and air the deeper Thailand progresses into its monsoon season. The rescue mission will see two divers assigned to each member of the Thai football team, with the total round-trip extraction time expected to take up to ten hours, with the footballers to be supplied with full-face diving masks equipped with a fixed airline. Over the period of the search divers have strung a rope-line leading through the various underwater passages and chambers, while the quality of water being pumped from the cave as seen in various media clips has improved. Mr Narongsak said the decision to proceed with the rescue operation had been discussed with the members of the Thai football team and their families, who had all agreed that it should proceed. Earlier in the week Thai King Maha Vajiralongkorn also expressed his desire for the football team members to be removed from the cave as soon as possible. According to Mr Narongsak “the boys are both physically and mentally fit and they all agree with the rescue mission. They all [the boys and their families] said they are prepared to encounter whatever lies ahead”. The 12 members of the Moo Pa (Wild Boar) Academy Mae Sai football team entered the cave on June 23. Heavy rain saw water levels inside the cave rapidly rise resulting in them being trapped at a point known as ‘Pattaya Beach’. Less than five hours after the rescue operation to save the 13 members of the Mae Sai football team commenced the fear that rescuers had been dreading arrived. Torrential rain. Reports from the rescue site say heavy rain has inundated the mountain range housing the cave. Over the past week several major sources of water leading into Tham Luang Cave have been diverted, but authorities have stressed that it is impossible to block all water sources. With rain enveloping the entire region how soon its effects on the on the current and clarity of water inside the cave are felt is not yet known. The possibility that the Moo Pa (Wild Boar) Academy Mae Sai football team might find themselves with 18 guests waiting for currents to ease this time tomorrow is not beyond the realms of possibility. This has been a developing news story. No further updates will be made. Live Streaming has now ceased.